Let go of inhibition, ditch the patterns and take a walk on your creative side. Using the book Artful Improv by Cindy Grisdela as our guide, we will introduce five basic techniques for improvisational quilting. Are you new to machine embroidery or need help identifying what stabilizer or needle to use? Do you love hand applique but never seem to have time for it? Patty will show you easy techniques to prepare your project and make it so portable, you'll take it with you wherever you go. In class, you'll work on a simple flower of her design and learn how to apply the same methods to your own projects. If you've always wanted to try your hand at hand embroidery or want to brush up on your skills, then come and learn the process of this enjoyable technique. This beginner friendly Quiltworx pattern will teach you basic foundation paper piecing along with efficient cutting and chain piecing techniques so your project comes together quickly. Learn to make a quilt from beginning to end in this comprehensive course. Students will work on a star wall hanging while learning the process of quiltmaking. We've broken the sessions down into two sections to allow you enough time to get your homework done! You'll start this session with your finished blocks. You'll learn how to set them together (with lattice, set blocks, etc. ), add borders, determine and mark a quilting design, develop quilting techniques, and attach binding. Beginning Wool Applique. This fun, no-stress class is the perfect time to try. The required kit contains everything you need to stitch this design in class. In this class you'll learn just how easy it is to quilt your projects on a Bernina. You'll learn the basics of free-motion quilting, ruler work, the Bernina Stitch regulator and gripper rings. Now that you have owned your Bernina Q20 for a while, you are ready to dive further into the features of the machine. Gloria will continue to share more techniques and embroidery secrets for creating beautiful machine embroidery in this lecture/demo class. Get ready for spring with this adorable table runner. Students can choose to make it 53" long (with 2 birds) X 18" wide or to make it longer (with 3 birds), resulting in a runner that will measure 64" X 18" wide. Join Sandy to make this custom Quilt Crossing design, Blue Hawaiian. This project is designed from Quiltworx Kaleidoscope mixer blocks especially for this retreat and features both a wall and queen size option. Pre-class preparation session to get you ready to begin sewing right away. Inspired by the book "Joyful Stitching" you will start with background fabric of wool, silk, or linen/cotton, draw shapes to make an unique embroidered project. The Hoffman Dream Big (43 X 43) panel is very popular and a great way to learn and practice your free motion quilt on your domestic or sit-down machine. Bogged down in your grand ambition for a Baltimore Album Quilt? Let DuAnn Show you how to applique invisibly by Machine. Create this handy needle felting reference booklet in class that incorporates samples of different needle felting techniques. Learn and practice this very popular technique to quilt on your home sewing machine. Learn the art of piecing free form curves without pinning, marking or clipping. Add interest by incorporating multi-directional and 3-dimensional elements. Learn the basic techniques of folding, clamping, and pleating to create resist forms in the fabric that stay until the dye process is complete. The 30" X 44" oval rug is a fun sewing project to make for your home, or as a gift for just about any occasion. Choose any of Jen's hand applique projects from any of her books or patterns and learn how to applique Jen's way. Pick any Jen's blocks or quilts from any of her books or patterns that use acrylic templates and let Jen show you how easy and relaxing hand piecing can be. The Log Cabin quilt may be steeped in tradition, but it has unlimited possibilities. We will use the 8" Log Cabin Trim Tool by Creative Grids to create perfec 8" finished log cabin blocks. Come and enjoy working on a Lunch Box Quilts applique pattern of your choice. Select from pattern favorites such as Scoop It Up, Cat's Meow, or whatever quilt pattern you choose. Is your top finished and your are wondering what to do next? If so, this class is just what you have been waiting for. Learn how to mark, sandwich, and machine quilt using both the walking foot and the darning foot. You will amaze yourself! Please ask for a supply list. A required kit is $10 and included in class fee. While making this lovely pillow, you will learn how to use your V8 software to digitize and build the center redwork motif. Have you always wanted to make a quilt that looks like a picture? This original technique developed by Cynthia England, uses freezer paper patterns. Do you love to sew but have a hard time with garments? Is pattern fitting a problem for you? Do you want to take your garments from "homemade" to VaVa Vroom"? Let Tim (oops I mean Teri) help you move forward with your garment sewing and design skills. This all-day class is a workshop of hands-on, supervised sewing for intermediate to advanced students who want extra help. Bring any garment project that you would like assitance in starting, fitting or completing. Guidance and encouragement will keep you moving forward with your sewing. Ready to try something new? This class offers two popular techniques. Quilt As You Go construction and the Bargello design concept. Join Laura Croft for an introductory class and dive into the colorful worrld of creating your own on-of-a-kind fabric collage. Join Laura for an introductory class to fabric collage and dive into this whole new world! 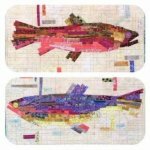 Design your project using Laura Heine's "Making Fish" collage pattern. We all have a favorite fabric that we just can't cut so here's the perfect solution - make it into a clever wholecloth Rockport Tote. Sashiko began when Japanese peasants developed a stitching technique that they called "little stabs" to patch torn and worn clothings. Modern Sashiko is a running stitch worked in repeating or interlocking patterns through one of more layers of fabric. You'll learn this relaxing technique as we work on a placement. The scalloped Flap Cross Body bag is just stunning and the perfect complement for almost any outfit. It features fancy hardware from Sallie Tomato and gorgeous cork. Use your serger and/or your regular sewing machine to create a simple by very flattering top for yourself. We are so excited by Bernina's new software that we are offering an exclusive club for those of you who own V7 Software. There is something for every level of experience with these easy, project-based classes. Software Sampler helps you discover the incredible world of embroidery software, one tool at a time. Besides the lessons, you'll get project handouts, designs, videos, a coupon good for that day, and more. Cost is $25 per class of $135 for the entire year (less then half the price). Why not turn that stack of t-shirts into a quilt that makes a great gift for a graduation or any other special occasion for your family or friends? This open-sewing class is perfect for those who want a little help with their quilting project or just want to sew in the delightful company of others. Ronald will be on hand to provide help or just to cheer you on! Learn some tips and tricks from our technician to keep your Bernina sewing machine running at optimal performance.